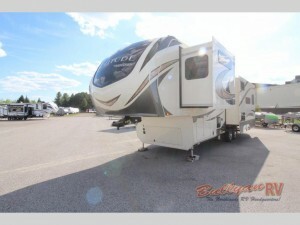 If you are looking for a great fifth wheel at an even better price, you have found it in the 2017 Grand Design Solitude fifth wheel for sale here at Bullyan RV. We are proud to currently have the 310GK model in stock that serves as an example of how amazing the Solitude really can be. We’ve put together our top reasons why you should consider buying this model, but we are confident that once you come by and take a look at it, you won’t need much convincing! 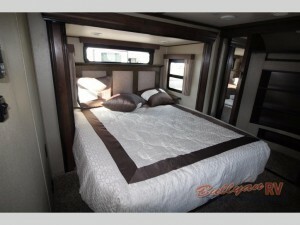 Check out the multiple slides on the Grand Design Solitude Fifth Wheel 310GK. The 310GK Solitude fifth wheel it outfitted with a spacious bathroom with a full-standing shower and porcelain bowl sink that will make you feel right at home no matter where you are. Private and easy to clean, this bathroom makes “going” anywhere a delight. The master bedroom comes standard with a queen-sized bed, which is more than enough space to really relax on when you are out on the road. However, if you want to really stretch out, the 310GK has an optional king-sized package as well. The Grand Design Solitude Fifth Wheel Bedroom. Who doesn’t want a television that appears as if from nowhere? In the 310GK model of the Grand Design Solitude, that’s what you get. A television comes right out of the base of a heat-producing electric fireplace, making it both scenic and comfortable to sit back and watch television on the road. Then, when you are done and need more counter space, it slides right back in it’s cubby. 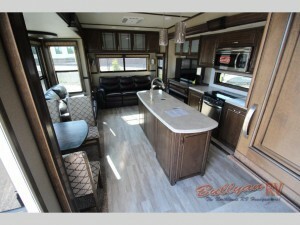 Check out the Grand Design Solitude Fifth Wheel Interior. With surrounding windows around the airy dining room table, you can really take in the surroundings of your favorite destinations while you enjoy breakfast in the morning or dinner at night. Or, if you just want a break from the weather, you can relax inside and play cards with your family while you still get to enjoy the great outdoors. With the prices that we are currently offering on the 310GK Solitude model, you absolutely will want to take advantage. At nearly $15,000 off the MSRP, this fifth wheel is a deal like no other! You don’t need to think twice about this decision; the Grand Design Solitude fifth wheel 310GK model can check off just about every box on your “must have” list. If you do want to take a look at it yourself or want to ask any more questions about this stellar model, you can contact us today for all of the details. We can’t wait to show off this beauty to you and your family!